“Tengo famiglia!” That’s an oft-repeated phrase in Joe DiPietro’s very family-focused comedy, Over the River and Through the Woods, the second show in Insight Theatre’s 2014 season. This is a show all about the importance of family and how a person’s family helps shape one’s own personal identity, and how different generations of a family can learn from one another. 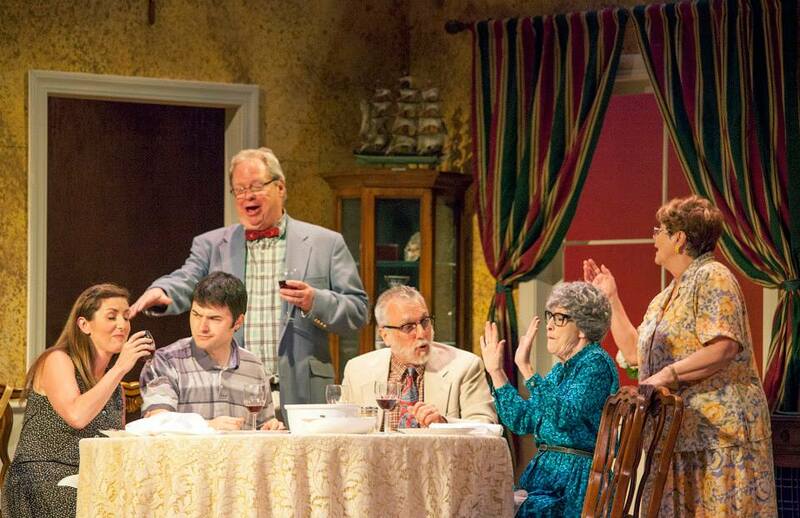 It’s a funny, heartwarming and charming story told very well by Insight’s excellent cast. Nick Cristano (Matt Pentecost) is a marketing executive from Hoboken, New Jersey, who still has dinner with all four of his grandparents every Sunday.For his proud Italian-American grandparents, the most important things in life are the “three F’s”–family, faith and food. Although they can be overbearing and occasionally embarrassing to Nick, they clearly care about him in their unique and frequently loud manner, with lots of food cooked by maternal grandmother Aida (Tommy Nolan), music and mild bickering from maternal grandfather Frank (Jerry Vogel), and lots of stories of the “old days” and personal questions from bubbly paternal grandmother Emma (Maggie Ryan) and boisterous paternal grandfather Nunzio (Tom Murray). When Nick surprises his older relatives with his announcement of an exciting job promotion that will require him to move to Seattle, they become determined to do everything they can to make him stay, including setting him up with a friend’s young, single niece, Caitlin (Ariel Roukaerts). Although this seems like something of a sitcom setup, it’s a little more complicated than that, as Nick and all four of his grandparents learn lessons about the importance of family, individuality and above all, real communication. The overall atmosphere here is one of a large, loving a loud family whose most important need is to communicate their love for one another in ways that both generations will understand. The setting is extremely well-defined, as Chris Regelsen’s detailed set evokes the homey atmosphere of the maternal grandparents’ house, and Laura Hanson’s costumes suit the characters well. The use of classic Italian-flavored pop music like Dean Martin’s “That’s Amore” to set the tone also adds to the experience. Although most of the action takes place in the 1990’s, that early era of the 1940’s and 50’s is a clear influence on the lives and personalities of the grandparents, which the music helps make clear. 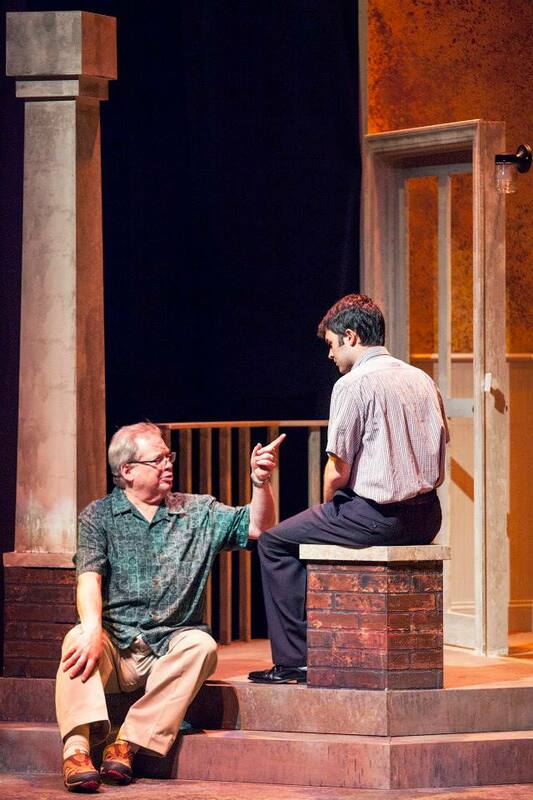 It also helps build a bridge between grandparents and grandson in the play’s most memorable scene. The characters are well-written and vividly portrayed by the excellent ensemble cast. Pentecost plays the exasperated young Everyman with ease, and he works very well with his four very colorful castmates. including Vogel as the stubborn Frank, Nolan as the sweetly overprotective and always cooking Aida, Ryan as the enthusiastic and maternal Emma, and Tom Murray as the energetic storyteller Nunzio, who shares a heartwarming, bittersweet scene with Pentecost in the second act that is one of the highlights of the show. Roukaerts has a lot of warmth and energy in her two scenes as Caitlin, as well, but the real focus here is on Nick and the grandparents, so the Caitlin character sometimes seems extraneous. It would be very easy with a show like this for these characters to come across as one-not caricatures, and it’s a great credit to this cast that nobody falls into that trap. It’s a strong, easily relatable cast that brings real warmth and dimension to the characters. Although the family portrayed here is Italian-American, and there are a lot of specific situations that those with Italian heritage will certainly relate to, the message here is also universal. I think a lot of people have that experience, as Nick has here, of having to get to know relatives they always thought they knew well. It’s listening, and sharing stories rather than simply viewing someone as a collection of idiosyncrasies that is important, as Nick learns in the positively delightful scene in which he and his grandparents sing and dance to the song “Yes, Sir, That’s My Baby”. The grandparents, in turn. have to learn that Nick is an adult who needs to be able to make his own choices in life, and both generations are reminded that family is family no matter how close by you live. There’s a lot of breaking the fourth wall, in which the characters talk directly to the audience and recall moments from their past. This works well for the most part, although it becomes a little too much in the play’s epilogue. Still, even with its few minor flaws (mostly in the writing, not the production itself), this is a thoroughly winning production with a great cast and excellent staging by director John Contini, who displays a personal understanding of the subject in the director’s notes in the program. It’s not a big or flashy show, although its fully realized characters give it a larger-than-life tone much of the time. This very strong cast has been brought together to present a very credible family dynamic and some very real warmth and emotion, in addition to a whole lot of laughs. I’m left with the impression that I was really able to get to know this family, and it’s a pleasure to have met them.